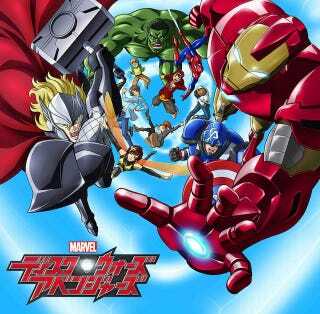 Back in October, we told you that Toei Animation was making a cartoon called Marvel Disk Wars: The Avengers, which would have a toyline from Bandai, and sounded suspiciously like it was going to be Pokémon but with Marvel super heroes. Well, rest easy — it's definitely going to be Pokémon but with Marvel super heroes. Here's the updated plot of the series: Loki has trapped the world's super heroes into discs, so of course a group of kids, led by Spider-Man, must run around the world collecting them. Supposedly the putting-people-into-disc-technology comes originally from SHIELD, so I imagine we'll get to see these kids "choose" their hero/discs to fight bad guys, who happen to be wielding discs with Marvel villains in them. Whether Howard the Duck will be redesigned as the kids' adorable, wacky talking animal mascot is as yet unknown. The only question now is whether Marvel will bring this cartoon/toy combo over to America. I imagine it depends on how big a success it is in Japan; I can't imagine them wanting to dilute the brand they're building with Avengers Assemble and their new animated universe without some proof that kids will spend bajillions of dollars on merchandise first.